Fine Decorative Wooden Pencil Available In Different Designs & Sizes. We offer our client an excellent quality range of Pencils. Because of the strict quality controlling and competitive prices. We have appointed an expert team of personnel who works sincerely in order to fulfill the requirements of our customers, both in relation to product quality and quantity. Our firm Geetanjali Exports specializes in providing our impressive clients with an impeccable array of Colour Grip Pencil. This is developed with the usage of quality proven material which attracts the children most. Staedtler Premium quality Pencil Wopex. In order to cater to the variegated demands of our esteemed clients, we are highly engrossed in presenting a top quality of Hexagonal Pencil. Kuchhal Nice Black lead pencils are used for smooth and fine writing.With this pack of Kuchhal Nice Black lead pencils we provide free kuchhal pencil sharpner and free kuchhal plasto eraser inside this box. 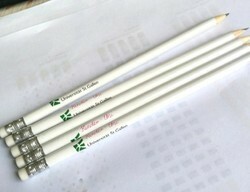 Woodfree or regular pencils printed with logo in 1 colour.